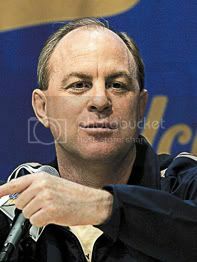 UCLA Head Coach Ben Howland updated the status of his injured players this afternoon in Westwood. Point-guard Darren Collison has started working out with the team but his playing status remains day-to-day. "Darren went through a little practice yesterday, not the whole practice," Howland said. "We had all our guys doing some extra shooting this morning and he shot the ball real well." Collison is not feeling any pain, Howland said, but it was more of an issue of Collison feeling comfortable with playing on his knee. "Every person is different, for Darrren, its gaining confidence in his knee," Howland said. "But each day he's getting more confident with it. He'll probably be wearing a brace for the first few weeks after he gets back." Alfred Aboya has been cleared to return from an eye injury to play Wednesday night against George Washington, but he'll be donning new eye wear when he sets foot on the court. "He's going to do goggles, not a mask, we just got the goggles today," Howland said. "He saw the doctor yesterday, and Dr. Goldberg an expert in the field at the Stein Insitute thought it would be better to wear goggles than a mask. He thought it would protect the injury better." The team has been looking for the right set of goggles for the doctors to approve for Aboya to wear in the game, even borrowing a few pairs from Gary Vitti, a trainer with the Los Angeles Lakers. Aboya will likely have to wear the protective eye wear for at least three weeks. Guard Mike Roll, who injured his plantar fascia a few weeks ago, went through about 35-40 minutes of non-contact drills yesterday with the team and will practice more today depending on how his foot feels when he visits the trainer. "I'm not sure when I'm coming back yet," the junior Roll said. "It depends when the doctor clears me to play." Howland still feels forward James Keefe can return to practice during the first week of December and then be back in the line-up by mid-December. Keefe is currently doing conditioning and non-contact drills with the team. With the spate of injuries the team has endured this season limiting it to just eight scholarship players for Wednesday's game , Howland was asked if this year was worse than the injuries the team faced two year ago. "This is worse than two years ago because in that year we had twelve scholarship players and the thirteenth player was Janou Rubin, a veteran walk-on." All good news. Roll should be back in a week or two prolly. Collison will probably sit out tomorrow and play against Texas, although it might be good to get some burn tomorrow. He's gonna be run to death by Texas guards. Actually, Darren is a game-time decision to play tomorrow against GW.